Africa is an incredible destination for a gap year trip, challenging, diverse and definitely an opportunity to broaden your horizons. There are also many opportunities to take part in voluntary projects in Africa, whether these involve building, working with children, environmental work or conservation projects. Budget to get voluntary work through an organisation, as you won't find paid work in Africa, and by paying to go with one of the organisations on this site, you will get the back up of the volunteering placement being organised for you. This will be invaluable as it means you will have someone to meet you when you arrive, your accommodation will be sorted, and you will be working with other people with similar interests. International Volunteer HQ (IVHQ) is the world's leading volunteer travel organization, providing affordable, safe and responsible volunteer programs in Africa including Uganda, Tanzania, Ghana, Kenya, South Africa and Morocco and in over 35 different destinations around the world. With program fees starting from just USD 10 per day, IVHQ is the volunteer organization of choice for thousands of volunteers every year. 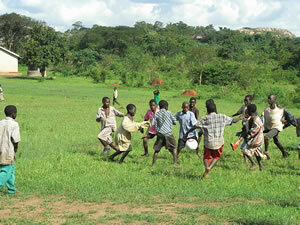 Kidogo Adventure is a small, personally-run organisation that enables travel and adventure through volunteering. The projects are based in Kenya and are all child-focused. It will be unsurprising to learn that Africa has many conservation and wildlife projects available. Such projects range from working as a lion conservation volunteer in places like Zambia to volunteering as a shark and marine volunteer in South Africa. Whether you are interested in the environment or want to work alongside qualified professionals looking after monkeys, cheetahs or the ‘big 5’ there can be no better destination than Africa from which to do this. Working as a conservation or wildlife volunteer in Africa is considered by many as the best volunteer placement you can get as you will experience unique involvement everyday on a level that doesn’t seem to be matched at any other gap year destination. African Conservation Experience have a range of projects on offer in South Africa, including working with experts tracking leopards, or marine biology studying whales and dolphins. If you are interested in getting work experience in this area, then these do offer you an amazing opportunity to work with zoologists and marine biologists on conservation projects. Another organisation offering placements in South Africa is Khaya. Their voluntary projects include working with children as well as sports development and wildlife conservation, and involve working closely with local communities. Volunteering projects are a great way to meet local people and really understand the issues that affect other people's lives. Personal Overseas Development (PoD) offer some great projects in South Africa and Tanzania, with the emphasis on ethical volunteering. They match local projects with overseas volunteers, working with wildlife as well as community based projects. If you want to work with people and especially with educating both children and adults then you should consider a volunteer education project in Africa. There are many rewarding projects at various locations across Africa where you can work in the community whether this be with street children, schools, settlements or individual families. You can get the opportunity to work with some of the poorest communities and help them with activities such as teaching, childcare and working to improve their shelter. A volunteer placement here is truly rewarding and an experience that will stay with you forever. GapGuru have a range of projects in Africa which could be ideal, includingteaching English in Tanzania. If you want to explore Africa, GapGuru have a fantastic trek up Mount Kilimanjaro, for a once in a lifetime opportunity. So if volunteering in Africa sounds like something you would like to get involved in, find out more through our volunteering section, or if you are specifically interested in conservation or community projects elsewhere in the world, take a look at the range of options available.